With a jaw-dropping resume that includes an illustrious career in music, both as a solo artist, film composer, as well as producing for the globally acclaimed artist collective UNKLE, Aidan Lavelle is making a big comeback to his dance music roots. In the past year, the UK-based producer has cranked out a slew of impressive releases, including 3 EPs for Rebellion and a string of remixes on respected labels such as Crosstown Rebels, Culprit, Akbal, and My Favorite Robot Records. His undeniably dark and funky brand of house music has earned him fans like Maceo Plex, Pan-Pot, Richie Hawtin, Pete Tong, John Digweed, Layo & Bushwacka, Fur Coat…and the list goes on. With a new album in the works under a new guise, Aidan Lavelle is destined to rise in the underground dance music ranks as he carves out his own shadowy, avant-garde sounds. We caught up with Aidan to ask him about his new project, producing music for films, what’s inside his studio, and what he’s up to next. Robotic Peacock: Hi Aidan, you recently played a string of gigs during WMC…how was it? 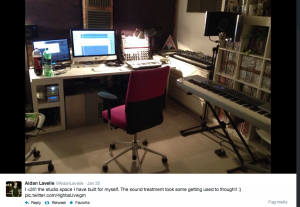 Within the last year and a half you’ve stepped back into producing dance music as a solo artist. What made you decide to come back to it? What drew you back in? To be honest I never really left it. In 2005 I started working with my brother writing/producing/co-producing under UNKLE. It was a 100% committed full-time experience that reduced my ability to do anything under my own previous monikers or my own name purely as the workload with UNKLE was too great. That meant I kind of slipped under the radar for 6 years, but a huge amount of my responsibilities with UNKLE were taking the reigns when it came to the dance music remixes between 2005-2011. If you check the credits on the Surrender-All Sessions my name should be there somewhere! I stepped away from UNKLE in 2011 as a conscious decision to build something for myself, and that’s where you see my name being introduced back into the work I am associated with. How does the creative approach differ when creating music for film or media versus producing dance tracks? I suppose the first thing and most significant difference is the fact that when your writing dance tracks or any track for that matter, be it rock or dance or anything else that is to be an artist release, you’re writing for yourself and your personal expression. When you are writing for film you have a client, and I don’t mean the director or producer (although you do have to answer to them, too! ), I mean the film itself. The film is going to tell you what it wants and a good composer submits to that and their instincts rather than just doing what they feel like doing. The irony is that I recently composed the score for a short film, and that required dance music, so the two worlds can collide! We saw a picture of your studio on Twitter. Tell us about your setup and name your favorite piece of gear you own. I’m fortunate to have been able to build up a nice environment to work and play in over the years, from my granny’s Bechstein Piano to various outboard, analog synths, and guitars. If you’re asking me my favourite bit of kit I own? Hands down my Mac, I would be handicapped without my computer. The hub of everything. You could take everything, but if I have my computer I can still make high quality music of a decent standard the rest are luxuries. As far as synths? I love my Moog Voyager, probably my most used synth. Also my Alesis Andromeda is pretty special. It’s worth noting I take a lot of my software seriously too and one of my favourite soft synths is the U-he Diva. My latest acquirements are my Apogee AD16x/DA16x which are a geeky high end AD/DA conversion dream. Tell us about your new moniker “Modal” that’s in the works. It’s ongoing. It’s more an ambient low tempo adventure for me. You’re working on a new album, Qis, under the Modal name…what’s the concept behind the album and what kind of music can we expect? Also, is there a date set? As above. I’m kind of working on two albums at the moment and I am deliberating whether to try and combine the two. The other album, being a straight dance album. I have a lot of film and Advert commitments at the moment so they both are not my priority but they will be in a months time. I have about 9 ambient tracks done for the Modal album but it might be worth me trying to combine it with the dance album to give some more sense of a story and journey. Tell us about any other upcoming releases/dates you’re excited about. I have just come through a string of remixes, so for me I need to concentrate on the film stuff then get the album(s) nailed!